Elvis impersonator Bruce Stewart is seen here with Forest Hill residents Shirley Howard (left) and Maureen Johnson (right) following a recent performance. Renowned Elvis impersonator Bruce Stewart recently played a performance at Forest Hill, and residents were nothing short of amazed at his talents, says life enrichment co-ordinator Craig Forrest. Bruce is no amateur Elvis impersonator, either – he has won Elvis impersonating contests across North America and has placed as a finalist in many others, according to his website, https://www.rockingwithelvis.com. Craig says the performance included a well-rounded list of musical genres Elvis performed during his career, including rock ‘n’ roll, country, gospel, and even a couple of songs featured in Elvis movies. “And he gave a little bit of information about the history of Elvis as he went along,” Craig says. The Kanata, Ont. 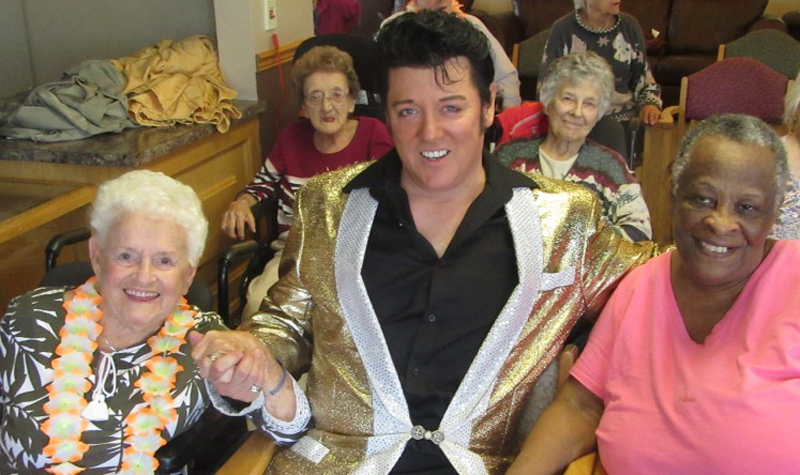 Long-term care home has been hosting a Las Vegas theme for the past couple of weeks, so having an Elvis impersonator fit in well with festivities, given that the King of Rock ‘n’ Roll played shows in Las Vegas during his career, Craig notes.